I was given a chance to visit the newest Kodanda Archery Range in Mall of Asia. 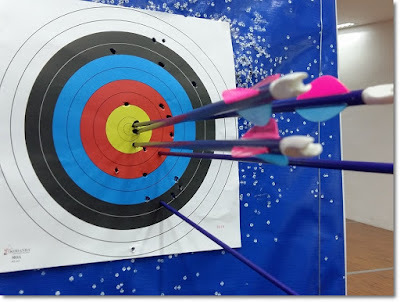 Since I am new to archery, I was thrilled of the idea so I took the opportunity. I'm not really an athletic type of person but I'm up to try something different especially when it's for free! 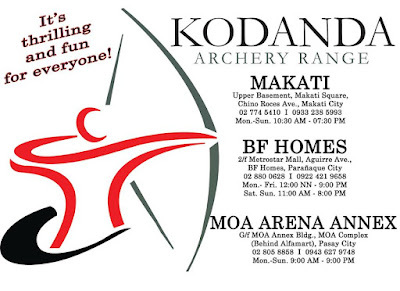 The branch is situated at the MOA Arena Annex at the back of Alfamart. You have to go thru the parking area for the entrance. For first-timers, the place is quite difficult to find but once you're there, you'll be greeted by a big signage. 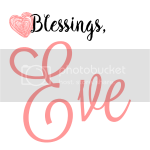 I brought my husband along with me and took the chance to have our "us" time. We want to build memories and try new stuff together as much as possible. When we arrived, we rest for a bit. There's only one instructor during that time (I guess because we were early) and she is currently attending to a student. 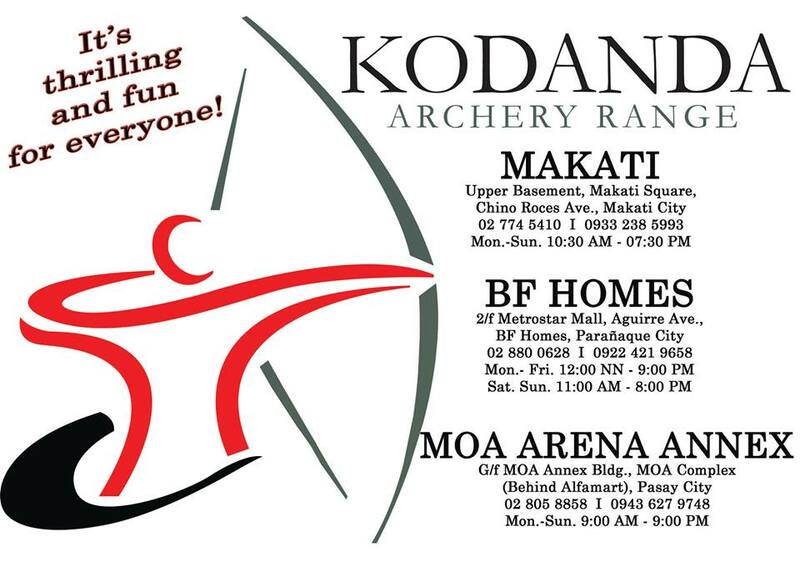 By the way, Kodanda is also offering archery lessons. Before we started, the instructor gave us set of equipment that we will be using and assisted us in putting them on. We were given an armguard, an arrow, a quiver, a finger tab and a bow. 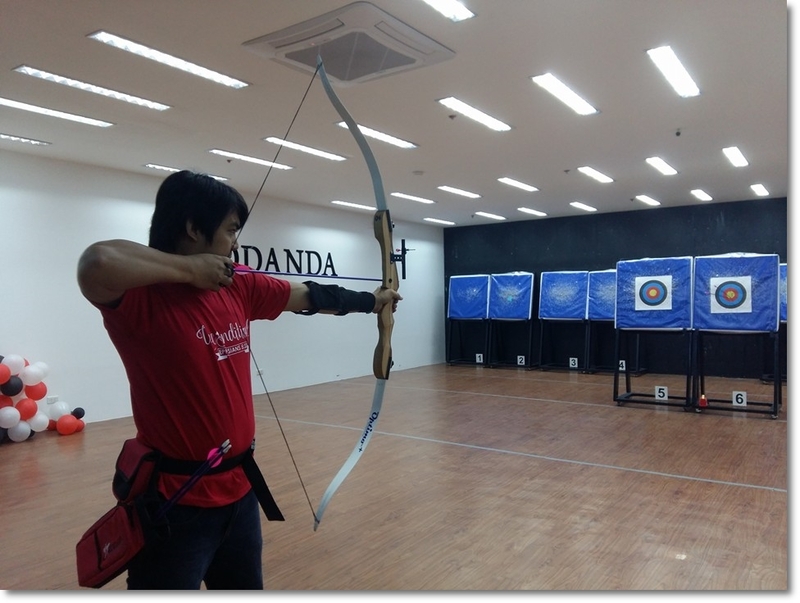 The instructor taught us the basic steps: Place your feet (stand with one foot on either side of the shooting line). Nock your arrow. Grip the bow. 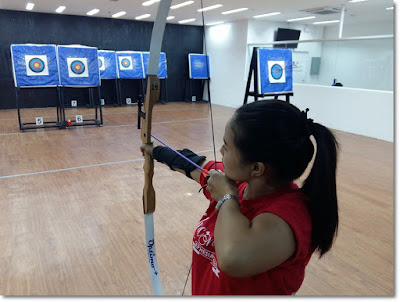 Push the bow away while pulling the bowstring. Find your anchor point. Release. I thought that was easy! The instructor will give you three whistles: 1st Whistle: archers may proceed to the shooting line. 2nd Whistle: archers may place an arrow on the bowstring and begin shooting. 3rd whistle: archers may walk forward to the targets and pull their arrows. Here's the result of our first round. Obviously, the one on the left side is mine. Hahaha! After the first round, I felt my arm is already aching. I think the bow is too heavy for me. 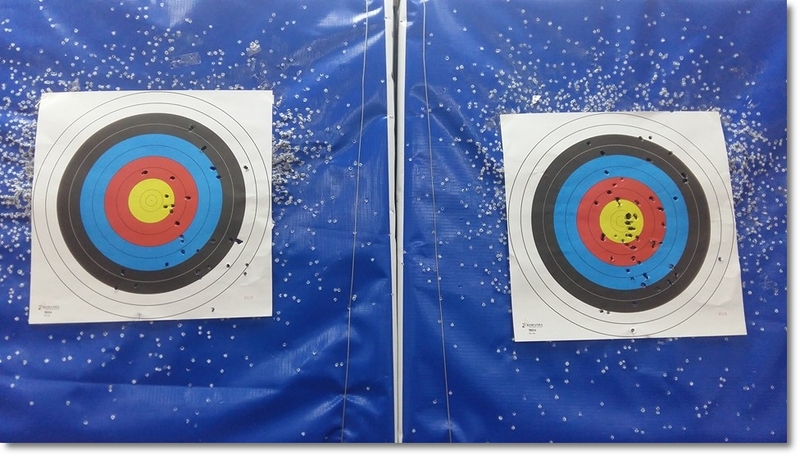 When the second instructor arrived, he advised me to rest the bow on top of my shoe while reloading. Phew! What a great relief. It's also a good thing that we have to rest while waiting for everybody to finish shooting before we can reclaim our arrows. I managed to make few more rounds but I really felt tired, my muscles were beginning to tense up. 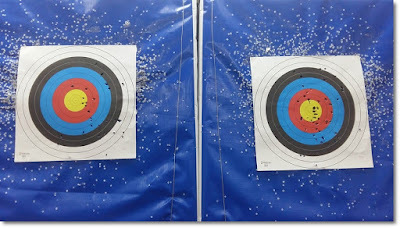 My shooting is becoming worst to the point where I was missing the target paper completely. Hahaha. Then I thought, it wasn't easy at all! I'm thankful I have my husband who is very competitive and enjoyed every single round. He tried doing the same thing every single time until he finally gets the proper coordination. 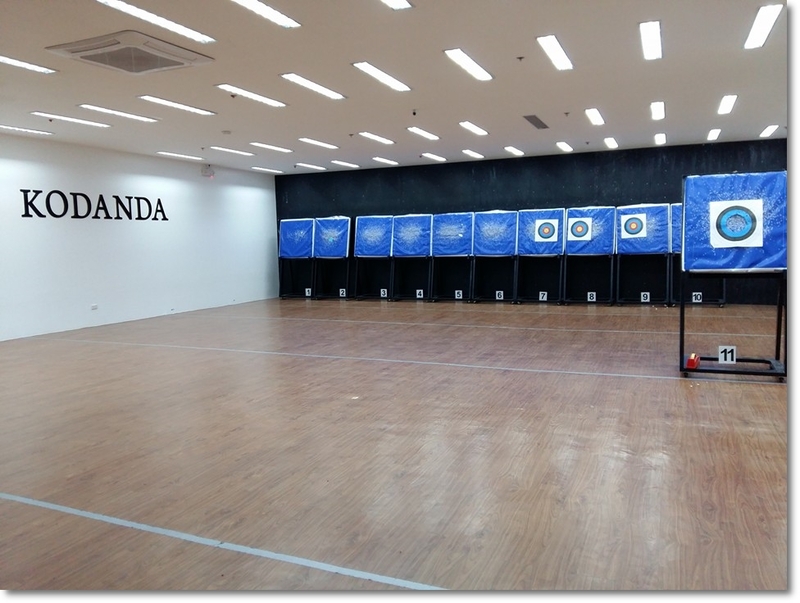 Consistent practice helps shooting becomes more instinctive. And it was evident on his target paper. As for me, I took rest and skipped some rounds to regain strength and enjoyed taking pictures of hubby instead. We tried long distance before we consumed our 1 hour and we were both in agreement that it is easier to shoot when it is farther. But you have to be still. Even the tiniest movement can make a huge difference. One twitch and the arrow won't even hit the target paper. This happened to me several times. Hahaha! I guess it's not bad at all, especially for first-timers. We brought this target paper home as a souvenir! 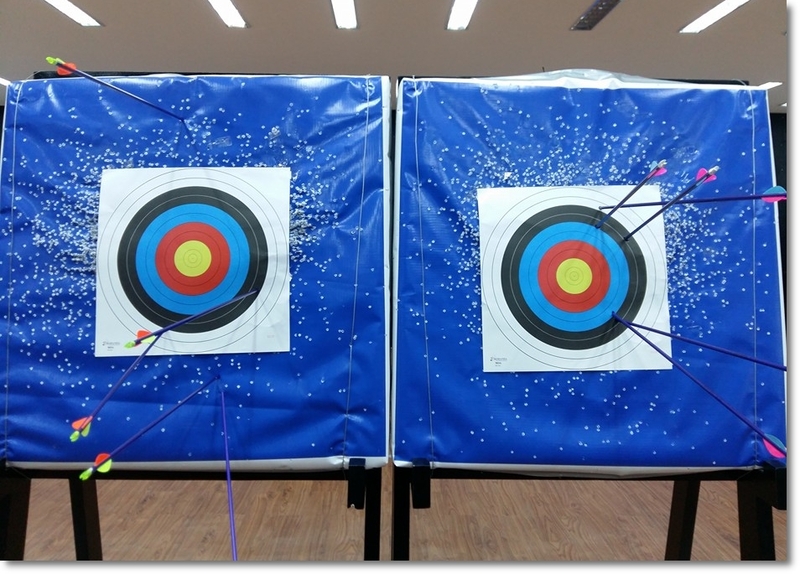 Archery may look easy but learning how to shoot the right way is more than simply slinging arrows, it requires focus, strength, and coordination. 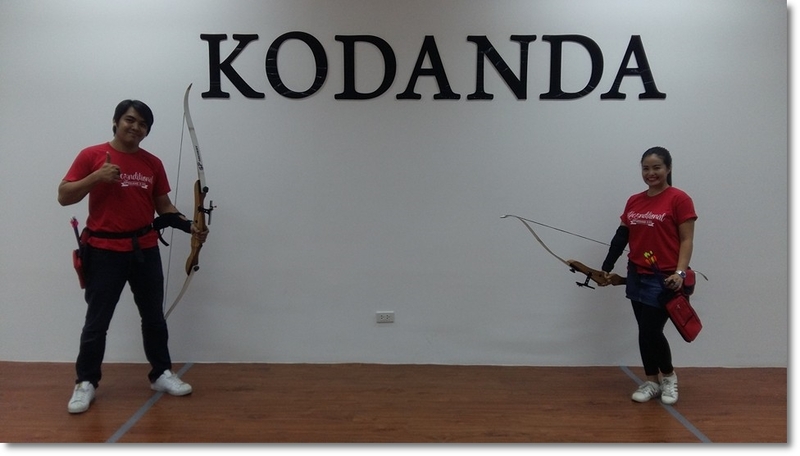 I am thankful to Kodanda for this one of a kind experience. It's very relaxing and fulfilling. Who would have thought that I'll be able to play archery in this season of my life? Well I'm glad I did and I'm glad to have the experience with my husband. This deserves another visit, hopefully with family and friends. Master the art of Focus. 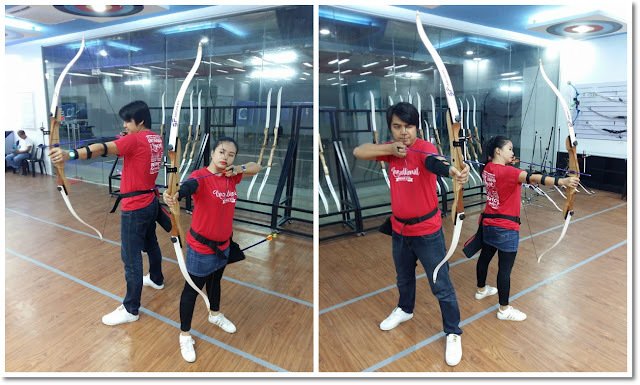 Unleash the Katniss Everdeen or Hawkeye or Oliver Queen in you! 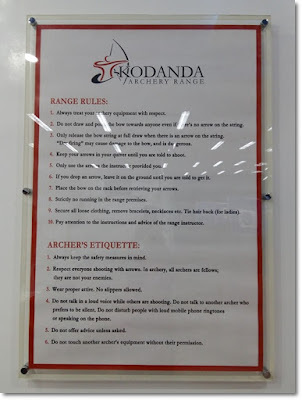 Visit Kodanda Archery! Check out their Facebook page here for more information. Thank you Ms Ethel for the invite! We had fun. 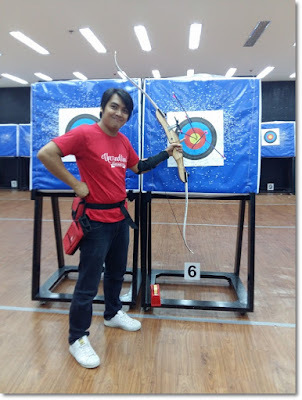 I took archery in PE in college. 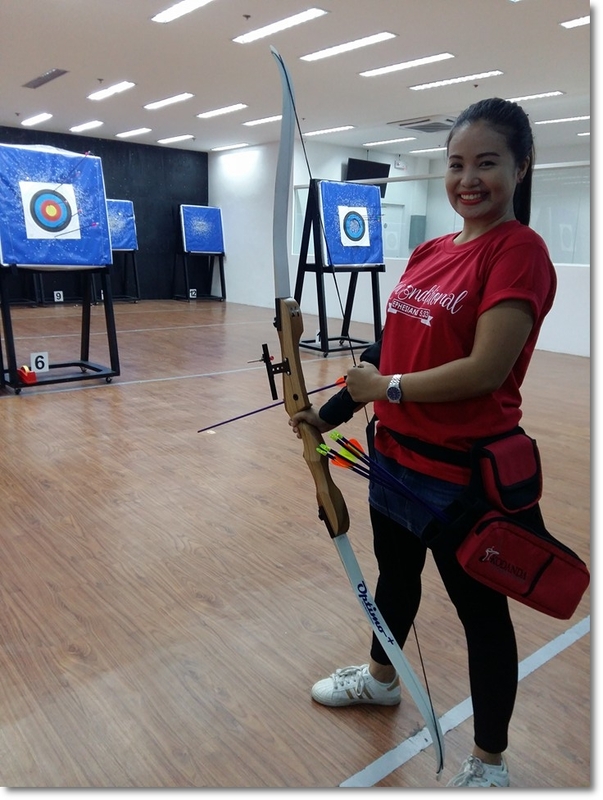 I was late to enlist in the blockbuster volleyball, bowling and badminton and so I ended up taking archery. At first I never thought I would enjoy and have fun, but in the end I found it to be a wonderful sport that teaches concentration and perfection. Usually Archery is at the bottom of the list but once you tried it, you will really enjoy. You should give it a shot Coi. I missed the target paper couple of times. Hahaha. By the way nice meeting you at the Blogapalooza. I agree with the action star or superhero feel. I feel like Susan, from the Chronicles of Narnia. Hahaha. He did Ms Tetcha, he's very competitive. I really want to try this with my husband too. 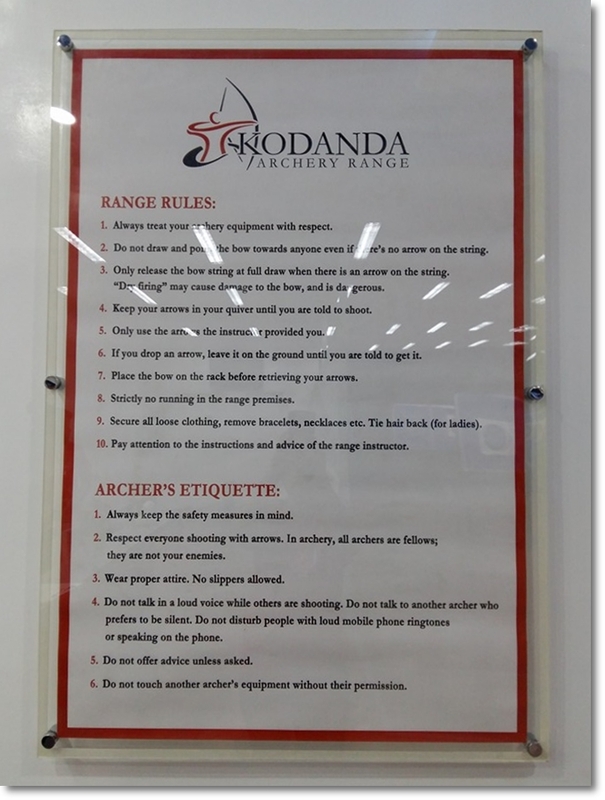 I've never tried archery ever so I'm not sure how I will do. 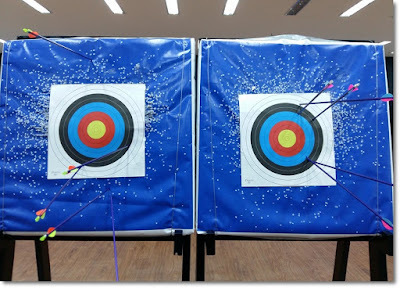 I hope I can at least hit the target. Haha! Ang galing ni husband! haha. Naexcite ako. Would want to try that as well. Would want to feel like.... Daryl of the walking dead. Ehehe. I'll recommend this to my brother. He has a thing for this and shooting ranges. Plus, he lives nearby too. I hope they can extend their discounted rate. I hope too. It''s great also for family and barkada. I don't think I'll do well in this activity but it looks like it's worth a try. It seems like a good date activity with the hubby. My idea of a father's day gift! :) Glad they have a branch in Makati when I searched. That's a nice idea Mommy Nini. 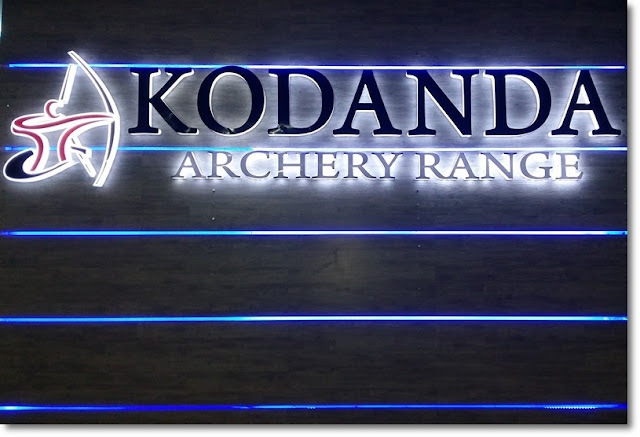 Go, bring hubby to Kodanda! Wow may kodanda na sa MOA. We tried their makati cinema square branch last year. Ang saya. It is appropriate time to make a few plans for the future and it’s time to be happy. I have learn this post and if I could I want to counsel you few interesting issues or advice. Maybe you could write next articles regarding this article. I desire to learn more issues approximately it! If so how do you stop it, any plugin or anything you can advise? I get so much lately it’s driving me insane so any help is very much appreciated. The bow hunting professionals must learn to sharpen their archery skills because they will need it in the woods. 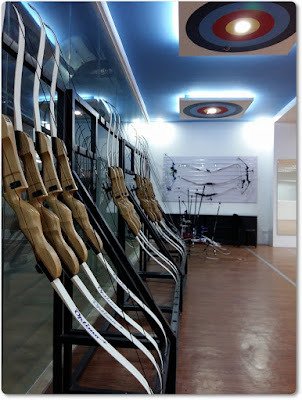 You can archerycloud.com about the archery tools on archery view which provides you bow information.